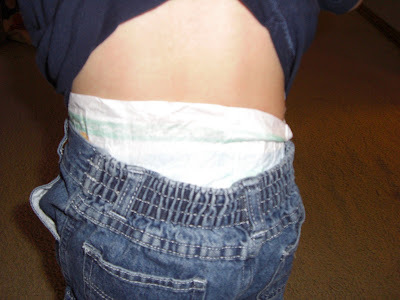 Does your little on suffer from droopy drawers? My little one does !!! Not anymore !!! I have feel in love with Dapper Snappers ! What are Dapper Snappers ? The Dapper Snapper consists of a short piece of suspender elastic with snaps that fits in the back 3 belt loops of children's pants (recommended ages 9 mo-5 yrs - one size fits all) and snaps over the outer 2 loops to cinch the pants thereby keeping them from falling down. *Eliminates the need for the more expensive adjustable waistband pants. *Does not need to be removed for diaper changes and does not impede potty training. *Is adjustable to 4 sizes. *Components (snaps, thread, elastic, everything), including packaging are made in the USA. Even the staples on the packaging are USA made. *Just won an Honorable Mention in the 2008 StartupNation Home-Based 100 Competition! Dapper Snappers are very easy to use.. See video below. Are you kidding me?? I need those! 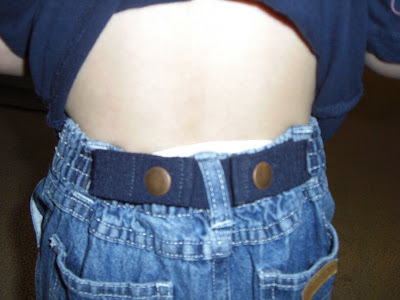 I suffer from skinny kids who don't fit the waist bands of the pants that are long enough for them. These would be so handy! Thanks for the review! LOL! So cool. I need that for my pants.